After a day off from their battles, Viktor "Isildur1" Blom and German pro RaulGonzales were back for another lengthy heads-up session at PokerStars $1k/$2k 8-Game tables, with RaulGonzales managing to hold on to a win for once, ending their eight and a half hour session with a $114,039 profit. The match started late afternoon and played through until the early hours of this morning with the pair logging 1,639 hands across two tables. All of the damage for Isildur1 was done during the first couple of hours of the match at table Aidamina as RaulGonzales took the lead early on in the match, a lead which he was never to relinquish. When the players took a quick few minutes break after 80 minutes play, RaulGonzales was already up over $83k, and he continued to win after the restart, adding a further $52k over the next 40 minutes. At this point the players switched tables and Isildur1 began a comeback of sorts, reducing the total deficit to under $70k after another hour and a half of action, only for RaulGonzales to hit another six-figure upswing, taking him to his high point of the match, up $183k just over three hours after the table change. 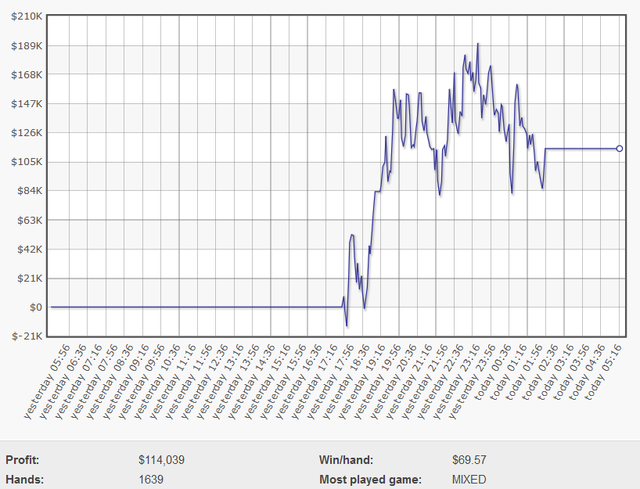 An hour later and Isildur1 had knocked $100k from that total, but when the dust finally settled shortly after 2am server timer RaulGonzales has made a total profit of $114k (although his total profit showing for yesterday is $146,270 as the session went on past midnight and the $32k Isildur1 made back during that time will be added to today's figures). Second on yesterday's highstakes leaderboard was Spanish NLHE specialist Andres "Educa-p0ker" Artinano who battled relentlessly at the $25/$50 and $50/$100 tables yesterday, putting in exactly 2,000 hands on his way to a $41,842 profit, much of which came from heads-up play against jinmay. Artinano is now up over $270k from his work at the tables over the past week after being absent from the high stakes games all year. Also present in some of the same games as Educa-p0ker was young Swiss pro LLinusLLove who put in over 1.1k hands at the $25/$50 and $50/$100 NLHE tables on his was to a $25,427 win - putting him in third spot on yesterday's leaderboard..
Rounding out the top four winners from yesterday's games we find Aku1206 who earned $18,001 from a couple of hours play in the $50/$100 PLO ring games. He played 268 hands across three tables, playing sessions in the morning and afternoon.